Has anyone seen the priceless commercials of Mastercard? This is a game where you post a pic and write a few or more things in the pic that costs whatever amount you want and the last item must be priceless. [img] [/img] on either side it. There. Use that. I don't like Image Shack very much, for that reason. Couldn't resist, sorry. I am on a Chuck Norris jaunt tonight. 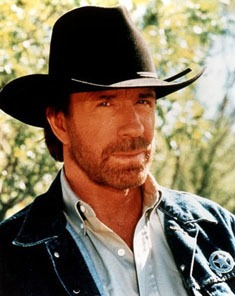 I don't know who Chuck Norris is. Are you serious? He's an icon in the movie world. I rarely see him now. I think the first time i saw him was in Dodgeball the movie. Anyways back to the game! Anyone else? A bunch of random code that dosen't really mean anything: Priceless. Pando, you stole my picture. When did eBaum steal that picture? You are a fanboy in every sense of the word. Nintendo, YTMND, and others that I can't think of right now. Oh yeah, and heroin. Hey, I am not a fanatic about Nintendo. Just YTMND. And he does steal stuff, there is proof. I will follow Nintendo into the deepest darkest pits of Hell, I am a huge Nintendo fanboy. I'm attempting to make a thing wiht the priceless thing here but I'm failing. I said I was a huge Nintendo fanboy but I don't go around saying things without any proof or reason like I do with YTMND. Why are you all out to get me lately anyway? I didn't do anything to you guys. I'm just messing around with the heroin jokes because of the Corrupt a Wish that you did, saying that you wished I would stop making drug references. I don't actually have anything against you, I'm just messing around. Sorry. EDIT: And us saying that you're a fanboy when you have openly admitted it wasn't supposed to offend you. I am the giver of truth, obviously. The feeling you get when you get to draw all over the television: Priceless.